Are you prepared for your road trip in Slovenia? Learn the rules of the road, traffic regulations and general information about driving in Slovenia here. Driving in Slovenia is on the right hand side of the road. Seat belts when driving a hire car in Slovenia are mandatory. All vehicles must have their headlights on day and night. Drivers are to carry a valid driver's licence at all times while driving, registration documents and insurance documents. 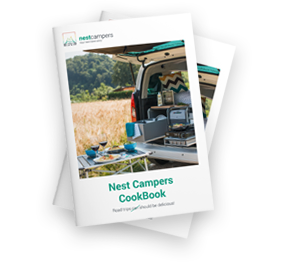 Using mobile phones while driving is not allowed – but worry not, Nest Campers have a hands-free system, so you can stay connected. The highest permissible level of alcohol in the body of the is 0.05%. The limit for novice drivers (less than 2 years experience), drivers under the age of 21 and professional drivers is 0.0%. Since there are frequent tests of drivers' alcohol intoxication, it is better that you do not drink if planning on driving afterwards. Petrol stations and pumps on motorways are situated approximately every 30 kilometres and open 24 hours a day. There are also many petrol stations in cities and towns. Parking is not allowed on yellow-marked spaces, blue spaces are for short stays only and white spaces indicate paid on-street parking. You must be at least 12 years old to sit in the front of a car.